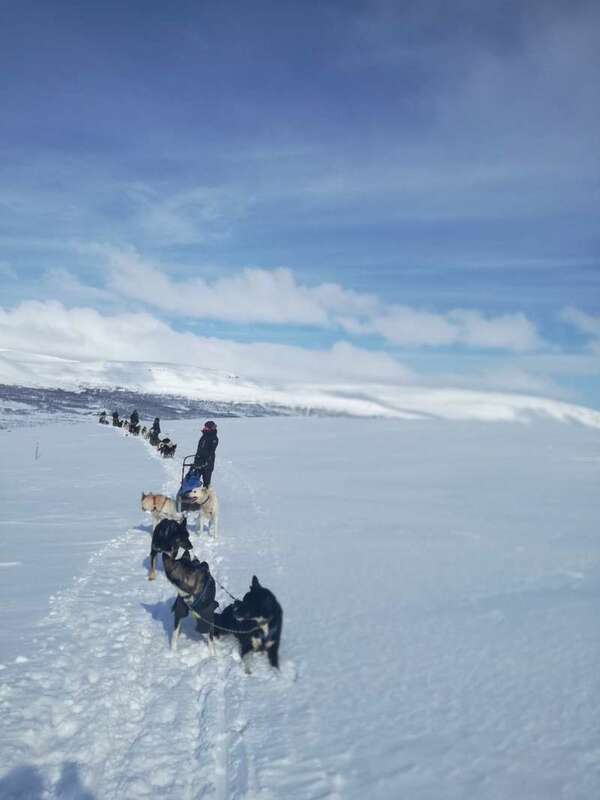 We are a dogmushing Company located in the North of Norway. In Winter we have the northen light and in summer we have the midnigh sun. We have about 100 dogs in our Kennel and all of them are weary special to us, so we need people who love dogs and love to work with dogs. 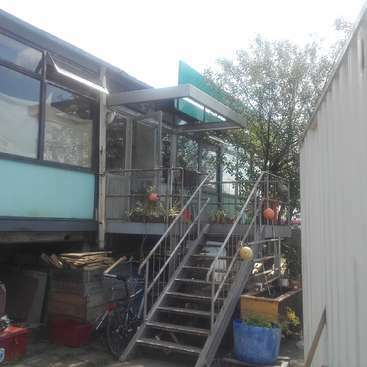 We need people who can help with feeding, training, repairing stuff. Most of the work is done outside, so if you like dogs and being outside this is a job for you. We like having people for longer periods, because its nicer for the dogs that the people working with them get to know them. 2 monts or more is perfect! Your efforts here will be rewarded with special experiences! The region is an exceptional place for hiking, skiing and mountainbiking with numerous peaks to climb and mountain lakes to discover. You will get to know the dogs with their different personalities and they will turn from strangers to friends. And you will get to enjoy the remote beauty and calmness of living out in the valleys. We have two locations where we keep the dogs in the summer. Both of them are in beutiful areas with alot of nice hiking trails and beuatiful Mountains. You will spend youre Time in between these two places and somethimes you will spend some time alone. In beginning of august we start preparing and train the dogs for the Winter, And we will need help with that. The summer is the off period for the dogs where we dont have any Tourist, but its still alot of work. The dogs need love, care and attention every day, so you need to be a dog person. We are also reparing and getting Everything ready for the Winter. 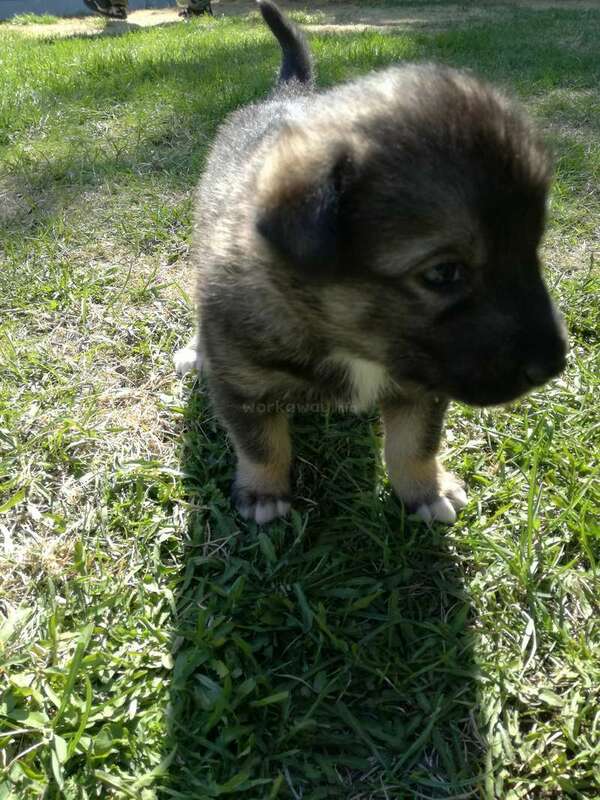 The summer is also where we have puppies. In one of the summer Kennels you will have no Indoor Toiliet, so if you need Indoor pluming all the time this might not be the Place for you. Driving Licence is a must, and we need people who can drive manuell cars, we dont have any automatic cars. Augusti- November is training period for the dogs, the Tourist season starts 100% in mid November. But from september and forward we might have some Tourist Groups now and then. Before the snow comes we use carts for the Tourist Groups. Then when the snow comes we start going on sleads. The Winter camp is located in a valley called Tamokvalley, we move up there somewhere between October and November depening on snow conditions. And its in the middle of some Amazing Mountains and there we provide trips for guest. 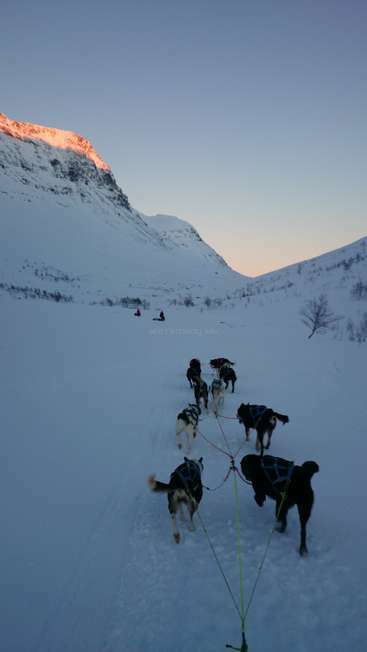 You will be working alongside our dogmushing guides with dogs and Tourists. You might also help with training, overnight guest, serving food, dressing Tourist and keeping the camp tidy. We are a big Group of people working in the Winter and we all live up in the camp. Its a wilderness camp with small cabins, you will have to be prepared to live Close to oher people, You might also spend some time down In Furufaten where we keep The race team, sometimes we need help down there. The Winters up here can be weary Cold and windy but they are also absolutley amazing with the northen lights and alot of snow. So you have to like being outside in all kinds of weather. We like having pepole for a longer periods of time so you get to know the dogs and the dogs get to know you. Driving licenese for manuell cars is also a must for the Winter. 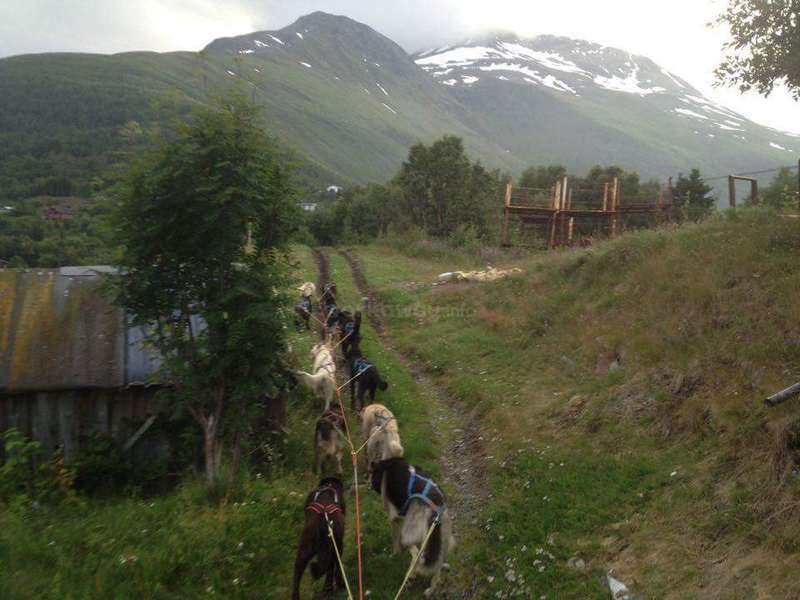 Both the summer and winter camp is close to Tromsø and to the Lyngen Alps. Here you will get to see some beautiful nature. The dogs are friendly and hardworking animals. We are looking for hardworking and positive people who are fond of dogs and nature. It was absolutly great staying with you from January - February 2019 with you! I worked as an overnight guide with the team member Kazune and the longterm workaway Jonathan. Our daily tasks mostly consist of preparing the breakfast for the overnight guests, going to the changing room and helping tourist to change their… read more clothes and shoes, giving them heads and gloves, helping to serve lunch / dinner and preparing the bedrooms for the overnight guests or showing overnights guests in the evening their accommodation. 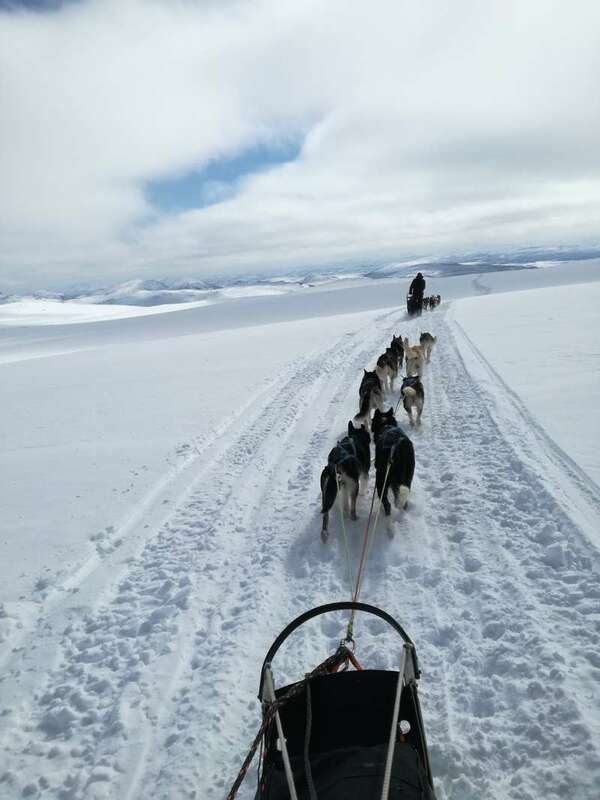 All in all there was time in between to play and cuddle the dogs, having a dog sledding tour together with tourists as well as going for ice fishing or seeing the Northern lights. The team there is very young and mixed - people from all over the world are working there from New Zealand to Poland, Tschech or Japan - this is very interesting and adventurous in the same time. Unfortunately there is only running water in the "main building of toilets + showers" so that we had to drink water from the river which we took from the river in front of the camp. I liked it a lot but you need to know that you cannot go quickly in your room to use your toilet or washing your hands quickly as there is none but you get used to it after a while. I would have loved to have my own personal room such as the longterm guides but they were all occupied so that I slept in an accommodation for guests which was ok.
You need to know that this is really a wilderness camp with less electricity, wifi and based in the middle of nowhere. If you like to stay outside, pure nature, a lot of dogs and different people from all over the world you will really love it! Tom and Nora as well as the other overnight guides and dog handler/musher always tried to take good care of you. I am thankful for the time I spent with you and would love to see everyone again! She has a great attitude! I spent two months here earlier this year and I had the best time. 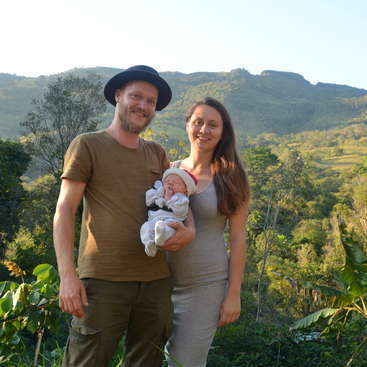 Tom and Nora are the kindest and most generous people you'll meet. I did a range of work but most of it centred around the dogs. Working with so many huskies was daunting at first but I very quickly came to love it, and to love all of the dogs. I'll miss them all forever and they… read more have a special place in my heart. If I could have, I would've taken Luna and Rose and Dynamite (and more!) with me back to Australia in a heartbeat. I would love to come back to work in the future, and knowing that's an option is great! Miss you guys. I was working here for four months. So of course I have to say that “this work can be quite demanding sometimes”, and there was more than one evening I fell into my bed really really tired, thinking a little bit mad about some of the more giant dogs who are so eager to pull the sled that its nearly impossible to get them into their harnesses and… read more to attach them to the sled. And if you are working with the guests, who are coming with buses from Tromsø twice a day, you have to calm down petite women, who don’t want to get in contact with dogs, nevertheless they’ve booked a dogsledding tour, or you have to explain some elderly that a Northern Lights Tour is impossible in the morning, but not the dogsledding, so they should do the Northern Lights Tour at night and go dogsledding in the morning. But in the end you’ve brought all five or six dogs to one sled, you hear them barking and see them jumping, waiting to feel the break getting out of the snow. And watching them to start makes you happy, I don’t know why, but it always made me happy to see the same kind of enthusiasm in all the faces, the same kind of astonishment about the dog’s strength, accompanied by the sled’s murmuring on the ice. Then they return to the Camp, and welcoming them in the “Restaurant Tent” floods you literally with their excitement. Although their gloves are frozen sometimes and their well-treated hair is showing through their hats like icicles, they are smiling and laughing and beaming all over. Besides the work, for which you should be a little bit outgoing and calm in spite of action/stress, I should mention the people working and living with you in the camp. They are making this place overwhelming warm, chaotic, welcoming, comfortable and mind opening. We have been around ten people last season, who are living in the Camp during the winter. So you should know, that you are going to be most of the time surrounded by the other, especially since we are sharing most of our cabins. There is always time and space for you to retire of course, but as I said: the team is very sociable. Sitting together, eating and chatting, or going together dogsledding/snowmobiling/snowboarding, fills most of our free time. Even if it’s a day with lots and lots of guests, everyone keeps being friendly and patient, so as a workawayer it was very easy for me to get into the daily routines as well as learning about all the small details when it comes to deal with the dogs and the tourists. Another fact that makes getting into the work easy is the possibility to find the work you like the most/you are able to do in the Camp- originally I came to work with the dogs for example. So I was meant to help feeding them, to clean the dogyard, to harness and unharness them. That was really nice, since you are working so close with these hundred of crazy dogs, who would cuddle all day long, if we could. 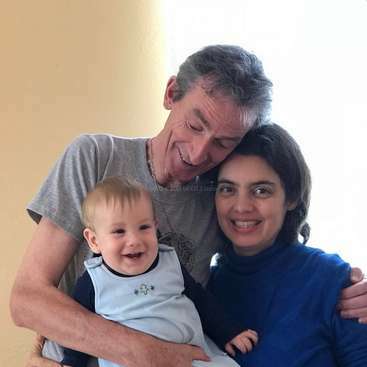 But as time went by it became clear, that being around the tourists, welcoming them, dressing them, serving meals, preparing the breakfast buffet, just to be there for them, is making me (and the guests) happy. So I started to do this. But I never stopped to work with the dogs, when there is no work with tourists it's just natural to contribute where some more help is needed! Everyone is worried about everyone in this team, everyone wants everyone to be happy. In a few months I’m going back to this wonderful place, employed for the winter season. Be open for things you’ve never done before, go there without prejudices about other nations, be honest in everything you say and do, be patient, be curious, be flexible, don’t judge. You can have the time of your life here. And while patting one of the cutest dogs in the kennel, Søta or Idun, even your worried ladies are telling you in the end, that they just had the most amazing outdoor experience in their life. It was my first experience as a workawayer and I'm so glad I met you guys. I spent 3 months (february-april 2016) at your place and will keep this time in good memory. I felt welcome from the first moment and we had a lot to talk and laugh. I liked to have so many dogs around who loves to cuddle all day… read more long. Sure I also had to work and somedays it was quite demanding. There was a lot to learn (not to mention the names of almost 100 dogs) and there were days when I was really tired: physically and mentally when I also worked long days. But then I also got the opportunity to drive a sled, more than I hoped to ;-), go on walks with the young dogs and saw some really nice northern lights. I now have good friends in Norway too and have to visit this nice place again! 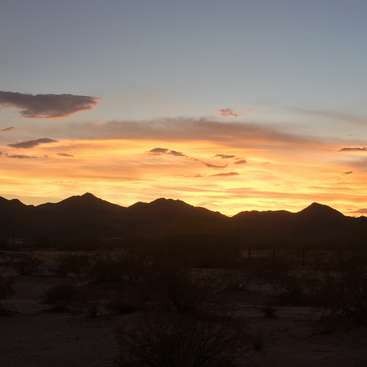 Start-up farming and research center in the Sonoran Desert, USA. Come and help us!